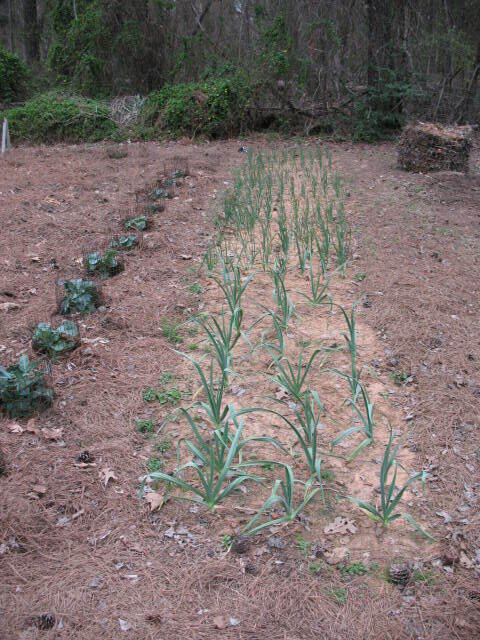 One of the most common mistakes that beginning gardeners make is plow up a huge garden and plant rows and rows of crops, then they spend the rest of the spring and summer fighting weeds. You will get higher yields from a smaller area and do lots less work, if you plant in beds. Many people think that crops are planted in rows because the plants need a certain amount of space between them in order to grow. It’s true that plants do need room to grow, but they don’t need near as much as is usually recommended on seed packets. Row planting was developed as a system when man first started using plows. Space was left between each row so that the plow animal would have a place to walk during cultivation. When mechanical agriculture came on the scene, the rows were spaced even wider. So unless you are using a mule or a tractor to cultivate, you don’t really need the space between rows. Look at your typical seed packet of bush beans. It will probably say something like, “Plant seeds 6 inches apart in rows 2 feet apart.” If you are doing hand cultivating using beds you can forget about the 2 feet apart. I plant bush beans in beds that are 4 feet wide, and I plant the seed 6 inches apart in each direction. Now think about it, I am planting 500 plants in a 100 sq. ft. bed. To plant the same amount of beans in rows that are 2 feet apart would take up 500 sq. ft. of your garden. And guess what’s going to grow in that empty 400 sq. ft. You got it,—WEEDS. The way I plant, the beans are close enough together that the weeds don’t have anywhere to grow. So while I’m sitting on the porch drinking iced tea, you’re out in your garden hoeing weeds. Doesn’t seem fair does it? 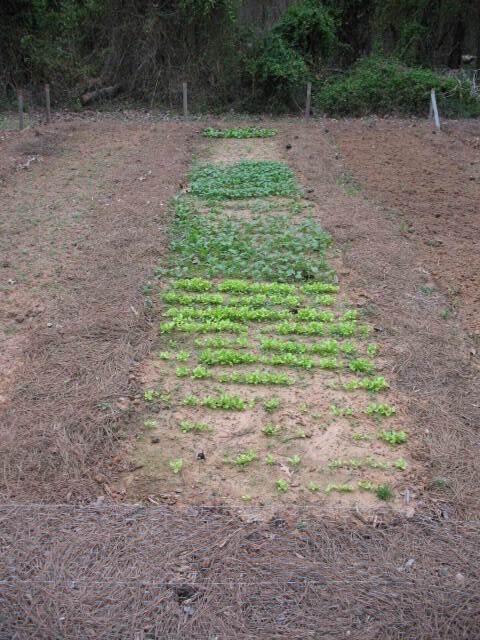 Pictured below: A bed of different kinds of greens in early March. Another advantage of planting in beds is that once a bed is established it takes way less effort to keep your soil loose and workable. I have permanent beds in my garden. I plant different crops in them each year, but I keep the same beds. My beds are about 4′ wide and I leave an 18″ walking path between the beds. I pile about 6″ of pine needle mulch on the paths to keep weeds from growing in them. I hand turn the beds with a turning fork to a depth of ten to twelve inches; and once a bed has been established, I never walk on it again. All planting, cultivating, and harvesting is done from the paths. By staying off of the beds, the soil does not become compacted and is easy to turn for the next planting. I do fudge a little bit by stepping into the beds when I re-turn the soil each season, but that’s about the only exception to my “don’t walk on the dirt” rule. My garden is about 1200 sq. ft. I have been gardening the same patch of land for over 25 years, and I have never used a tractor or garden tiller on it. I couldn’t do this if I was row planting, but by planting in beds it is easy to keep the garden up with nothing more than a turning fork, a rake, and a hoe. Pictured below: A bed of garlic and onions. This bed has 25 garlic plants and about 300 onions in about 100 square feet. The one concession that I make to mechanical gardening is that I use a gas powered weed-eater to cut down bush bean vines after I have picked them clean. I tried cutting them down with a yoyo but this tended to pull the roots up along with the vine. I want the roots, with their attached nitrogen nodules, to stay in the ground and enrich the soil; so I yielded to modern technology in this instance. Bed planting cuts way down on the time you will spend weeding. As mentioned above, I don’t have to weed bush beans or field peas at all because of the dense planting. My walking paths are kept mulched so there’s no weeding there either. I mulch around my tomatoes, squash, peppers, and cucumbers so that I only have to weed a very small area right at the base of the plants. I do have to weed a little along my pole beans; but here again, mulching right up close to the vines keeps weeding to a minimum. The only thing that I just flat out have to weed is my onion patch. I haven’t figured out a way around this one, but if you have tried anything that works I’d sure like to hear about it.